One of the first steps when getting a tattoo is choosing a tattoo style. This article will break down and explain 10 popular tattoo styles you can choose from. Looking to add some new art to your skin? Getting a tattoo is a bold, exciting choice that you’ll want to consider carefully. After all, they’re meant to be a permanent mark on your body. It’s best to choose a tattoo that represents you in some way, expressing your personality to the world. Humans have a grand history of tattooing themselves over the centuries. The Ancient Egyptians used tattoos for ritual purposes. In contrast, Ancient Romans marked their slaves with tattoos for identification. Tattoos have been used in all forms of tradition and taboos. Before making a choice, consider the many tattoo styles available. How you wish for your tattoo to appear is as important as what you want tattooed. 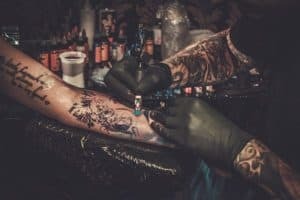 Check out our guide below on the different tattoo styles. These are the tattoos you think of during the early years of American tattooing history. Picture a sailor or a biker with their sleeves marked with the memories of their travels. Imagine bold, black lines with solid colors of red, green, and yellow. Tattoos in this style have a rather simple appearance, almost like clipart. This is due to the capabilities of the era they were born from. That said, they still express the character of the time with their rebel-like qualities. The subject matter will generally revolve around eagles, skulls, anchors, and pin-up girls. There’s more to explore in the traditional American tattoo style, check out our article here. This is the “old school” style evolved with modern capabilities. They still feature heavy outlining and saturated colors, but new techniques allow for a 3D-like quality. New school tattoos take the old subject matter to a whole new level. That simple representation of the bald eagle you’re familiar with? Now it’s been hyped up with an American flag for a backdrop and an AK-47 clutched in its talons. Some tattoo artists have become quite skilled at replicating real-life portraits. Many tattoo styles seek to exaggerate the figure being represented, but this style seeks to emulate the form perfectly. When done well, these tattoos can be quite extraordinary in their aesthetic. If you have a loved one you’d like to memorialize or an animal that best represents your inner-soul, it’s a great idea to go with a realistic depiction of them. This style of tattoo blends the realistic portrait with traditional “old school” qualities. Rich, saturated colors and heavy outlines mixed with realistic shading give rise to this type of tattoo. This sort of tattoo seeks to be less like a tattoo and more like artwork ripped straight out of a graphic novel. It’s an expressive style that captures the figure being represented with a fun, colorful, and vibrant display. Tattoos of this style are inspired by the indigenous members of the world. Think of the peoples of the Polynesian islands or the Berber women of North Africa. Typically, they are big, geometric patterns that come together to cover much of the body. Lots of solid, black shapes and lines. You might think the design is quite basic. But really, the intricate patterns can have a great variety of artwork. This can make for a piece that easily allows the eyes to wander over your tattoo. While a taboo in their culture today, the Japanese have a rich history of tattoo styles, dating as far back to 10,000 BC. Tattoos of this style mimic the large, woodblock artwork traditional to Japanese culture. Prints would be mass-produced by carving out designs on wooden blocks. Then, they would be lavishly inked with rich, saturated colors to be pressed onto paper. These tattoos are grand works of art that cover large portions of the body, typically the arms and/or torso. Most often, they’re intricate figures of dragons or flowers mixed with detailed patterns. Choose tattoos of this style if you want an elegant piece with a rich history to adorn your body. The pseudo-watercolor technique is one of the tattoo styles on the rise. These tattoos seek to emulate the smooth, plush-like brush strokes of actual watercolor paintings. No more bold outlines in this style. Instead, they create a cloud-like appearance by blending and fading the colors together with the skin tone. Tattoos in this style have a surreal, poetic quality as if to appear out a dream. This style of tattooing comprises all the rest but seeks to accomplish its representation using only a grayscale palette. There are two methods within blackwork to create proper shading. The first is to use solely black ink and dilute it with water for lighter shades. The other, perhaps deemed ‘improper,’ is to mix in white ink for lighter shades. Or you can have your tattoo done completely in solid black. Then, the artist will use your skin to differentiate between the figures, shapes, and patterns. You’ll want to plan your design accordingly and discuss with your tattoo artist how to best create your blackwork tattoo image. Like blackwork tattoos, dotwork is a mode of tattooing that achieves a full picture using only dots on the skin. While it might sound simple, it’s a delicate task to master for any artist. Dots are spaced perfectly apart to give the appearance of depth. This is a pseudo-shading technique unique to the style. Dotwork is most commonly used with geometric shapes and patterns. However, experienced artists can still emulate traditional subject matter using the dotwork technique. If you’re looking for a simple but effective way to express your love for someone or share a meaningful phrase, there’s always the script tattoo. Here, you’ll want to collaborate with your artist to choose the best font style for your tattoo. There are many flourishes and accents to include, but it’s up to you and what’s suitable for your text. Fair warning–if you’re choosing a phrase in a foreign language, be sure to have a native speaker doublecheck the translation! Speak with a Tattoo Artist Today! We’re glad you’re considering a new artwork for tattooing, and being so conscientious of how you want it done. Take some time to ponder over your desired design, and then give us a shout when you’re ready to speak with an artist. We’ll be happy to give you the best advice on how to achieve your dream tattoo.